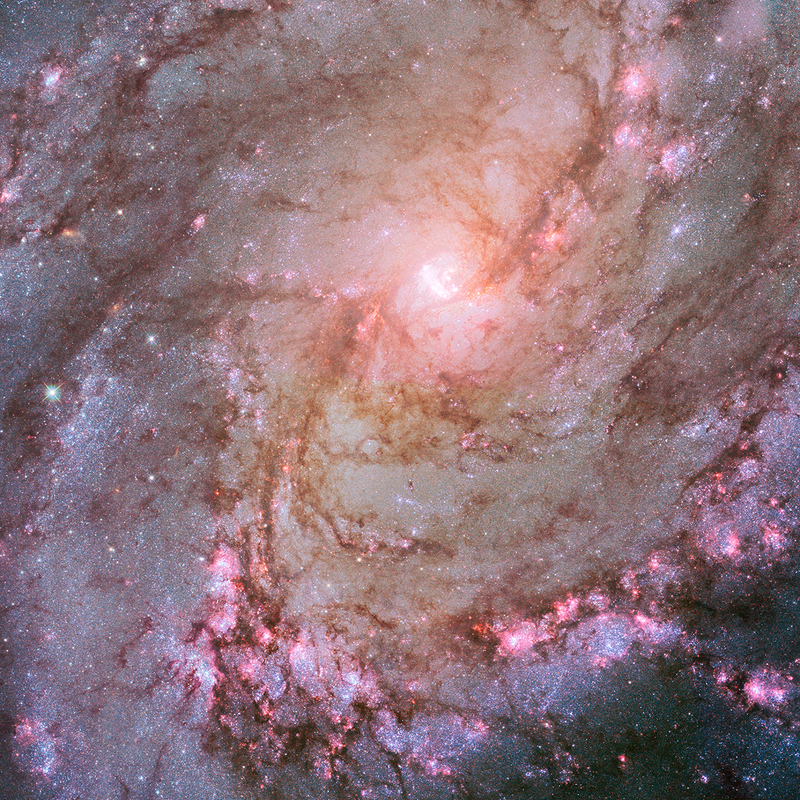 15 million light years across space-time toward the constellation Hydra the serpent, you will find this beautiful 55,000 light year diameter mess of a star city cataloged as barred spiral galaxy, Messier 83 or M83 for short. 55,000 light years in diameter isn’t huge for a galaxy but its close proximity at only 15 million light years makes it a prime target for observation. In this fantastic Hubble image you can see the structure of spiral arms almost as if you can see its motion. Those spiral arms are laced with dark star forming material and bright pink bursts of star formation all throughout. At its core is a supermassive black hole which it’s believed is fueled by the funneling of material from the bar of stars (thus barred spiral) across the nucleus. M83’s nucleus has its mysteries though as it appears to be a double nucleus. It doesn’t appear to be a double supermassive black hole, but instead a supermassive black hole being orbited by a massive collection of stars or an uneven disk of stars which creates the appearance of a double. In addition to that, neither of the cores are aligned with the kinematic center of the galaxy. What about oddities, what’s M83 offer? As many of you know on rough average, we see one supernova per galaxy every hundred years or so. M83 has offered up six supernovae since we’ve been observing it. Only two other galaxies have had that many; Messier 61 which has six also, but the supernovae king is NGC 6946 with nine! Before we close, I do want to offer you a visual; maybe even a slight thought experiment. When I began this post I mentioned that if you head toward the constellation Hydra you will find this galaxy but really think about that process. The constellations are made up of stars in our own Milky Way and our small corner of the Milky Way at that. That means you will leave the constellations of the night sky behind almost immediately and travel almost the entire 15 million light years with only the void of space and the light of galaxies to keep you company. And since you asked, the galaxy M83 also inspired a band called, you guessed it, M83 and since you’re asking my opinion, give “I’m sending you away” and “Starwaves” a listen. Name: Messier 83, M83, Southern Pinwheel Galaxy. What is it? : Barred spiral galaxy. How big is it? : 55,000 light years in diameter. How far away is it? : Roughly 15 million light years. Apparent magnitude: 7.5 or +7.5. Discovery: February 23, 1752 by French astronomer, Nicolas-Louis de Lacaille. 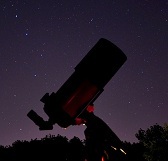 Charles Messier added it to his catalog of non-comets 30 years later in 1781. Where is it? (General): Constellation Hydra the serpent and the largest of the 88 modern constellations and the prominent member of the Centaurus A/M83 Group. Where is it? (Exact RA/Dec J2000): R.A. 13h 37m 0.91s / Dec -29° 51′ 56.74″. Image | This entry was posted in Astronomy (Learning), Astrophotography (DSOs), Galaxies, Images and tagged Astronomy, Astrophotography, Black Hole, DanSpace77, ESA, Hubble, M83, Messier 83, NASA, Space, Space Telescope, Spiral Galaxy, Supermassive Black Hole. Bookmark the permalink.